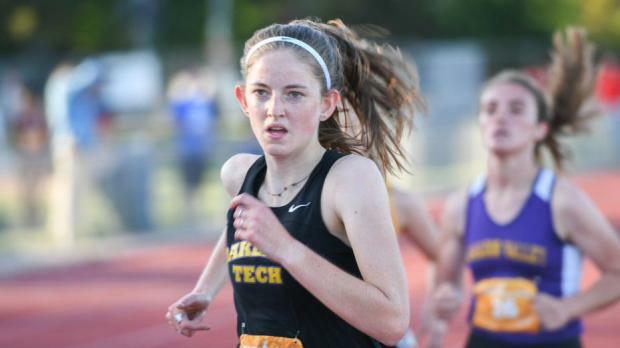 Oakland Tech's Caroline Garrett is a five-time Oakland Section champion and three-time State Meet qualifier. Results from the 2018 Oakland Section Track and Field Championships appear to reveal one simple truth: The future looks bright. Of the 26 individual events contested, 17 section titles were won by athletes not in the graduating class of 2018. Of the 16 running events across boys and girls, only one title -- the boys 400 -- was captured by a senior (Oakland Technical's Henry Larkin). In 2017, Oakland Section senior boys took home eight of the 13 titles. In 2018, the senior class grabbed just five. On the girls side, however, seniors have won only four events in each of the last two seasons. In 2016, senior girls won just one event while freshmen -- the 2019 senior class -- dominated the meet with five individual wins (three by Briona Rivera and two by Caroline Garrett) along with eight of the 12 top-six places in the 100 and 200, four of the top five in the 1600, and 11 other top-six places at the meet. That year senior boys won just five events. Do these results verify that senioritis is alive and well and thriving every spring in the Oakland Section? Will the Class of 2019 buck the trend and be the outlier? This girls class has been working toward that for the past three years. Our examination of the 2019 Oakland Section track and field season will very much reflect a review of the end of the 2018 season. Note: Returning athletes are referenced by their current grade.